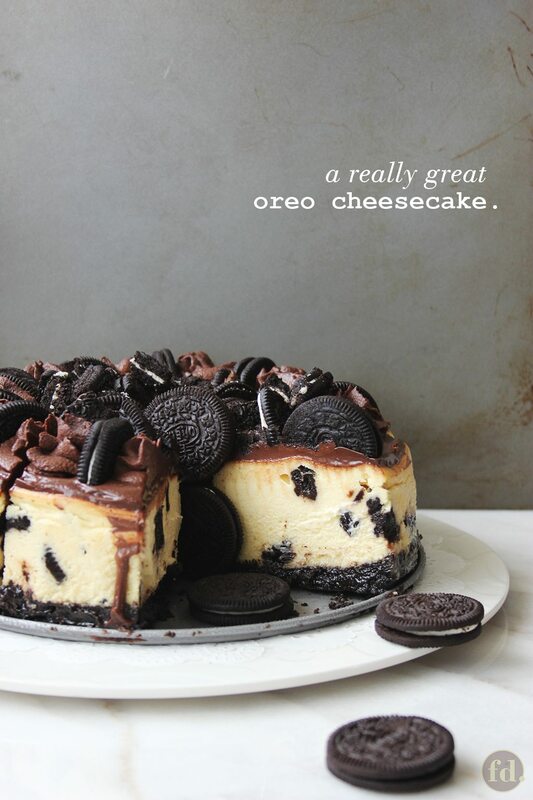 You are here: Home / Recipes / Snacks & Treats / Cake Recipes / Oreo Cheesecake, Love at First Taste! 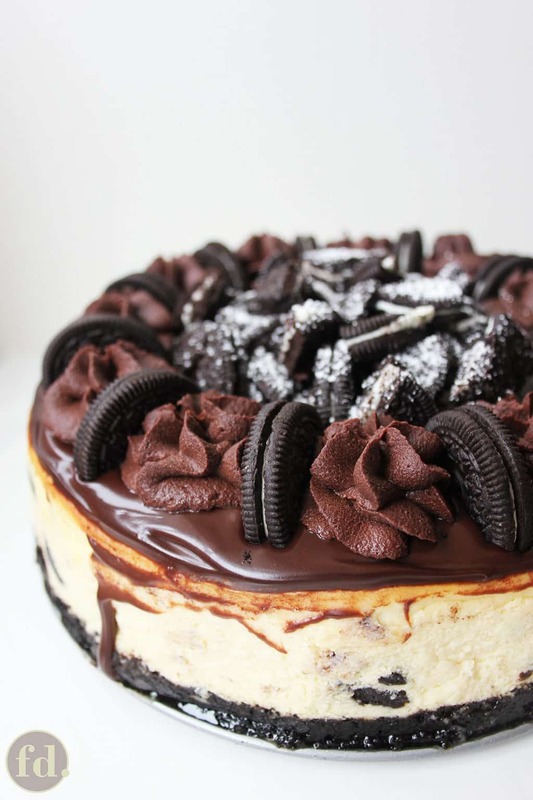 This is a blissfully delicious Oreo cheesecake that sweet dreams are made of! 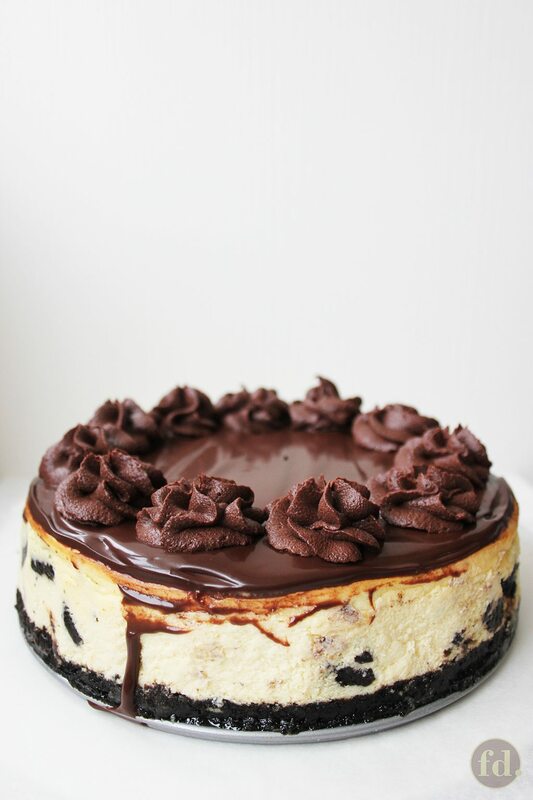 It starts off with a toasted Oreo cookie base, topped with a decadently rich and creamy cream cheese layer filled with chopped creme-filled chocolate Oreo cookies, topped with a luxurious chocolate ganache glaze and even more… oh yes, you got it…. Oreos! I tend to think that less is always more when it comes to cheesecake. But in this instance, more will totally wow you! Like this rich and creamy Oreo cheesecake topped with chocolate ganache glaze and whipped chocolate ganache (oooh, wouldn’t you know it, I really, really have this thing for chocolate ganache), piled and loaded to the brim with even more Oreo cookies. 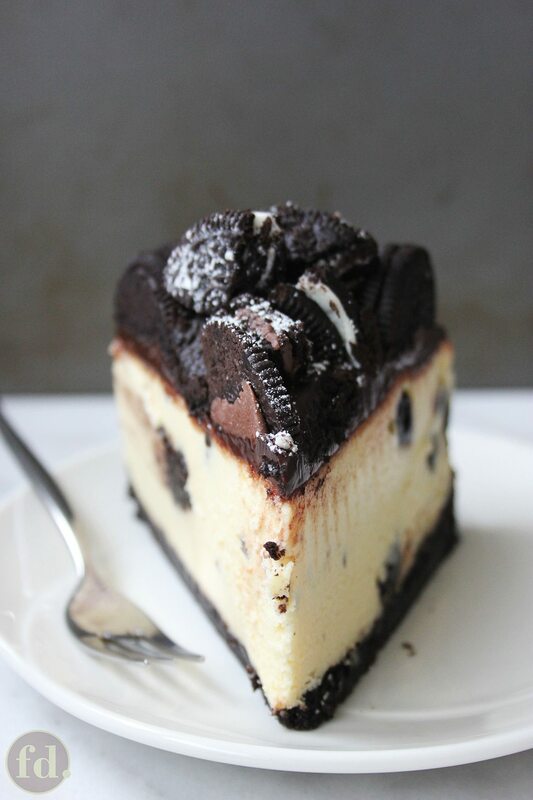 And where chocolate ganache meets Oreo cheesecake, where fudgy bittersweet chocolate kisses soft, custardy, tangy cream cheese, your taste buds will absolutely pop with the richness and creaminess of the flavours, tasting soooo deliciously divine. The original recipe, adapted from iwashyoudry, makes a really good Oreo cheesecake as is. 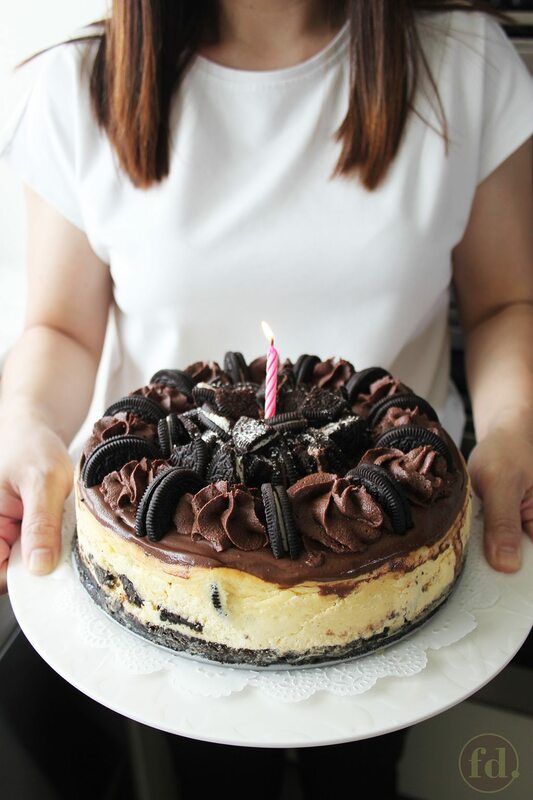 So if you like to keep your desserts simple and neither have an inclination for, nor the time and effort to make toppings and edible decorations, this Oreo cheesecake served plain promises to be luscious, rich and creamy. In the original post, the author uses a really quick, easy and effortless way to dress up an Oreo cheesecake (plus it’d be a great way to hide any unsightly toasted spots or cracks on the surface). Simply spread roughly chopped Oreo cookies (throw assorted flavours like mint and chocolate Oreo cookies, for example, into the mix) across the top and dust generously with sifted confectioner’s sugar all over – it’ll look and taste that much more amazing!!! Let me just say that cheesecakes are really easy and simple to make, once you’ve got the basics down. Trust me, I’ve had my fair share of misadventures with cheesecakes (overbaked, underbaked, cracked top, sunken top, burnt top, etc. etc.,) and through all it all, I’ve realised that all cheesecakes need are our love, patience and a little understanding, to create perfection. And YOU CAN GET THAT PERFECT CHEESECAKE! 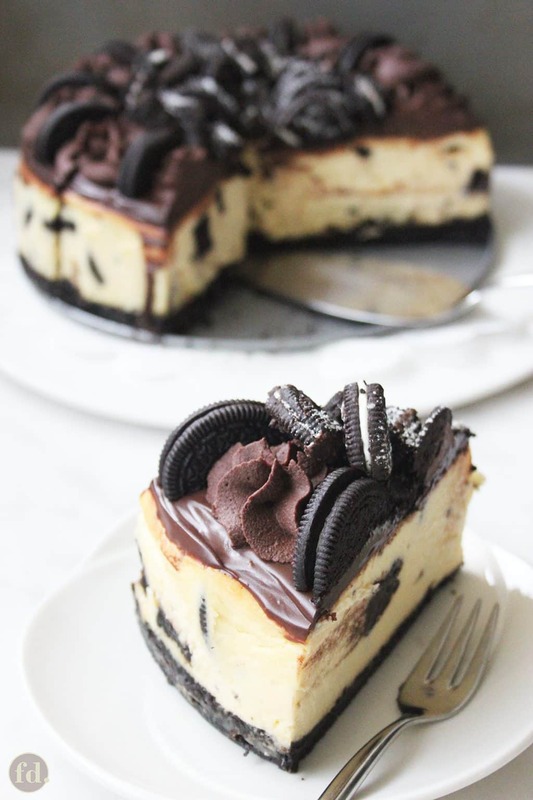 Put love into your cheesecakes by using, wherever possible, fresh and good-quality ingredients – since cheesecakes are essentially more a custard than a cake batter, the list of ingredients is typically quite a short one, usually requiring cream cheese, eggs, other types of dairy, sugar, butter, and a variety of biscuits or cookies (eg. digestive or graham biscuits) for a base. What you put in will come back at you, so do start on the right track with good, even premium, ingredients. Cheesecakes really do need to be given time to bake through (even after you turn off the oven), and even more time to set and for their flavours to come together. It’s a dessert that only tastes better with time, so you should aim to make your cake at least a day or two in advance (or if making way ahead, cheesecakes freeze really well too). I usually find that the flavours and texture of a cheesecake are optimal and best savoured on the 2nd day after baking (for instance, if you’re planning to serve your cheesecake on Sunday, you would bake it no later than Friday). Perhaps where we, as home bakers often tend to find that cheesecakes can get a little tricky, is learning to resist the urge to overwhip the batter, and recognising when a cheesecake is done baking in the oven. I would have to devote an entire post to this, but don’t worry, I’ll spare you the science… but I do hope you can spare a moment to read my extended recipe notes below for getting the perfect cheesecake texture in a nutshell. I do so want you to succeed, and get the best out of your time, effort and expenses, and understanding some essentials might just save you from having a disaster on your hands! 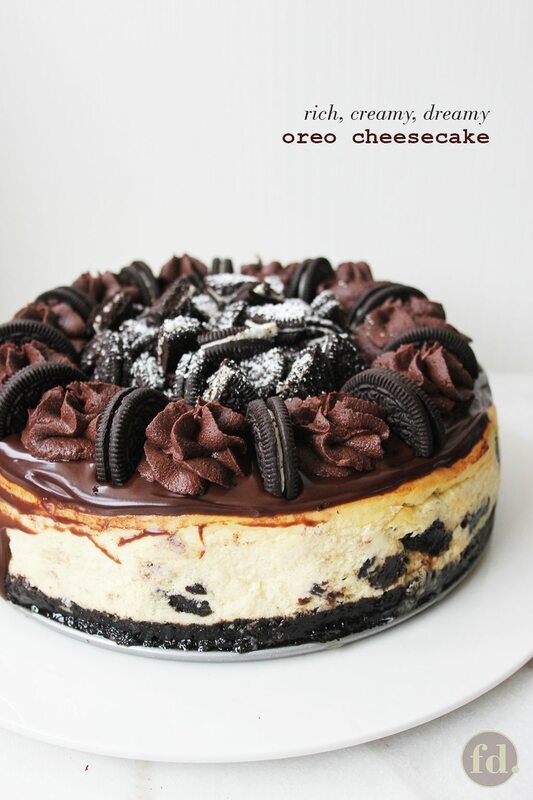 Do give this a try, and make your Christmas feasting just that much more sweeter with this glorious Oreo cheesecake! My friend (above) and I are definitely starting our Christmas feasting early! 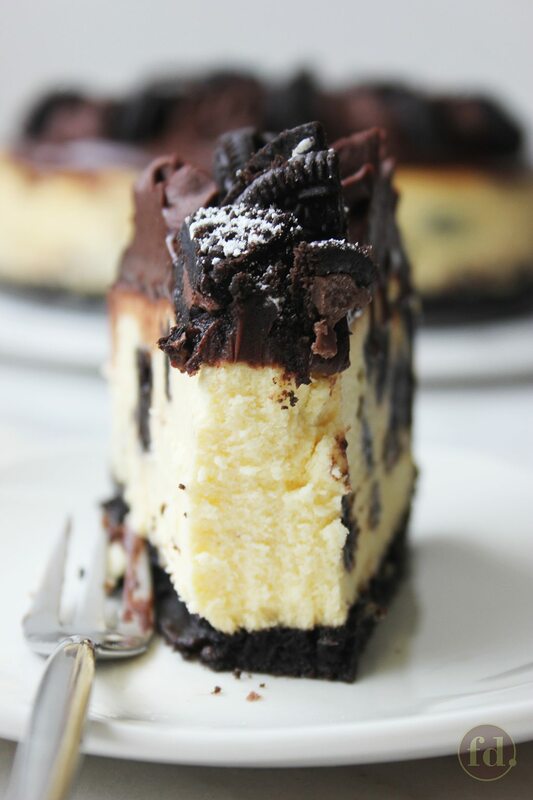 A blissfully delicious Oreo cheesecake that starts with a toasted Oreo cookie base, topped with a decadently rich and creamy cream cheese layer embedded with chopped bits of creme-filled chocolate OREO cookies, and topped with a luxurious chocolate ganache glaze and even more... oh yes, you got it.... Oreos! Place an oven rack for the cake in the middle of the oven. On another rack below it, place a shallow baking tray and fill two-thirds full with water. Preheat oven to 160 deg C (325 deg F). Wrap a layer of aluminium foil under and all around the sides of a 22-cm (10-inch) springform pan. Pulverise Oreo cookies (with fillings) in a food processor until fine crumbs. Pour in the melted butter, and pulse until well mixed. Pour out into the springform pan. Using the back of a metal spoon, press into the bottom and a little up the sides, and level the crust evenly. Bake for 10 minutes in the oven, remove and set aside. In an electric mixer fitted with a paddle attachment, beat the cream cheese on medium speed until smooth. Add the sour cream, sugar and vanilla extract, and beat until well combined, scraping down the sides of the bowl to mix equally. Add the eggs, one at a time, beating until well mixed before adding the next. Gently fold in the chopped Oreo cookies, until just incorporated. Gently pour into the prepared springform pan. Bake for 1 hour 15 minutes, or until the edges of the cake are quite set, and the centre 2 to 3 inches of the cake is only slightly jiggly. Turn off the oven, leave the oven door slightly ajar, and let cheesecake rest inside the oven for at least an hour. Remove from the oven after this time, and allow it to cool completely to room temperature. This may anywhere between take 4 to 6 hours, depending on the environment. When completely cooled, wrap the cheesecake (with pan) in several layers of cling wrap, and chill in the refrigerator for at least 12 to 24 hours, to allow it to firm up and set. Finely slice or chop up chocolate into pieces no bigger than 1/4-inch. The thinner or smaller, the easier it will be to melt. Spread out evenly in a mixing bowl. In a small saucepan, heat up the the cream to almost a simmer. Take it off the heat and immediately pour all over the chocolate pieces, and leave it for a minute. Using a small spatula, starting from the centre, stir the mixture continuously until a smooth emulsion (glaze) is reached. This may take a few minutes. Set aside, allow it to cool and thicken slightly until it reaches spreadable consistency. If whipped ganache is also desired, whip half of the ganache with a whisk until soft peaks form. As the ganache is cooling, take the cheesecake out of the refrigerator. Unmould the cheesecake. Spread ganache glaze on top and pipe whipped ganache. Decorate with chopped Oreo cookies, and dust with sifted confectioner's sugar, if desired. Put back in the refrigerator (covered) and chill for about 15 minutes to set the ganache. Take out of the refrigerator about 20 minutes before serving. To make very clean slices, heat up the length of the blade of serrated knife over a small flame until hot. Slice as desired (be sure to slice the blade all the way down to the cookie base), and use an offset spatula to help loosen the cookie base off the pan. # Beat the cream cheese and sugar until the mixture is smooth and lighter (but not fluffy), this should only take a few minutes at medium speed. The aim here is to beat just long enough to smoothen out the lumps in the cream cheese. The key is NOT to beat at vigorous speed or until fluffy, as trapping a lot of air in the mixture may later lead to shrinking, cracks or sunken tops. # Keep mixer on medium speed at all times, or even at low speed if necessary, when incorporating eggs, sour cream, extracts, etc. Again, the aim here is just to beat until well combined, and not to introduce more air into the batter. If instructed to fold in ingredients, do so with gentle and light moves of the spatula, and only until just combined. # Always bake at a low temperature (between 150 to 160 deg C or 300 to 325 deg F - I've baked at temperatures as low as 140 deg C, and they turn out fine). Cheesecakes are essentially custards which need to cook through gently and slowly, resulting in that fine, creamy texture, and not bake through like other types of cakes (higher temperatures may cook the custard too quickly and cause the eggs in the custard to curdle, resulting in a lumpy, ricotta cheese-like texture). # Always bake in a water bath. The moisture from the water in the oven helps to keep your cheesecakes moist as it bakes, and perhaps, more importantly, can help prevent cracks or fissures from forming on the surface of the cheesecake, especially if you need to prolong baking time. A water bath also helps distribute the heat evenly throughout the oven, in case there are unusual 'hot' spots in areas of your oven. # Wrap the outside of the springform pan with a layer of aluminium foil all around the sides. Although this is not necessary, I find that it helps to keep the sides from browning too quickly (especially if you have a dark-coloured pan), should you need to bake the cake for much longer than anticipated. # Do not open the oven door at all during baking. I know this one is tough! But do refrain from frequently opening the oven, even if it's just to take a peek to see if things are going well. Internal temperature test: Insert an instant-read food thermometer in a spot halfway between the centre and the edge of the cheesecake, i.e. just off-centre. The cake is done when its internal temperature reaches 65 deg C (150 deg F). Once this temperature is reached, turn off the oven, let the cake cool in the oven with the oven door slightly ajar (use a wooden spoon to keep it ajar if necessary) for an hour. The cheesecake will continue to bake in the residual heat of the oven. If you have to take a temperature test more than once, insert into the same spot as before, as pricking holes unreservedly can lead to cracks and fissures. The jiggle test: When the edges of the cake are quite set, with the centre 2 to 3 inches only slightly jiggly, the cake is done baking (bear in mind that the centre of the cake refers to a general area in the centre that's about one-third of the diameter or surface area of the cake, and does not refer to a a single spot). Do not bake until the centre sets, otherwise you will have over-baked the cheesecake. If the centre area still looks shiny and is quite liquid, continue to bake for longer, checking every 10-15 minutes, or less time in between, if it looks to be almost done. # If your cheesecake is taking longer than the stipulated time, check to see if it's done roughly every 15-minutes, or less time in between, if it looks to be almost done. Cheesecakes typically take an hour to 1 hour 15 minutes to bake, depending on the recipe, as a general guideline. # After sitting in a turned-off oven for an hour, remove the cheesecake from the oven, and allow it to sit in the pan (do not un-mould) and cool completely to room temperature. It is natural for cheesecakes to shrink a little as they cool. This may take anywhere between 4 to 6 hours, or longer. Once it has cooled completely, wrap and seal the entire cake (with pan) with several layers of cling film, and into a sealed plastic bag, and chill in the refrigerator for at least 12 to 24 hours, to allow it to set and to give it enough time for the flavours to come together.